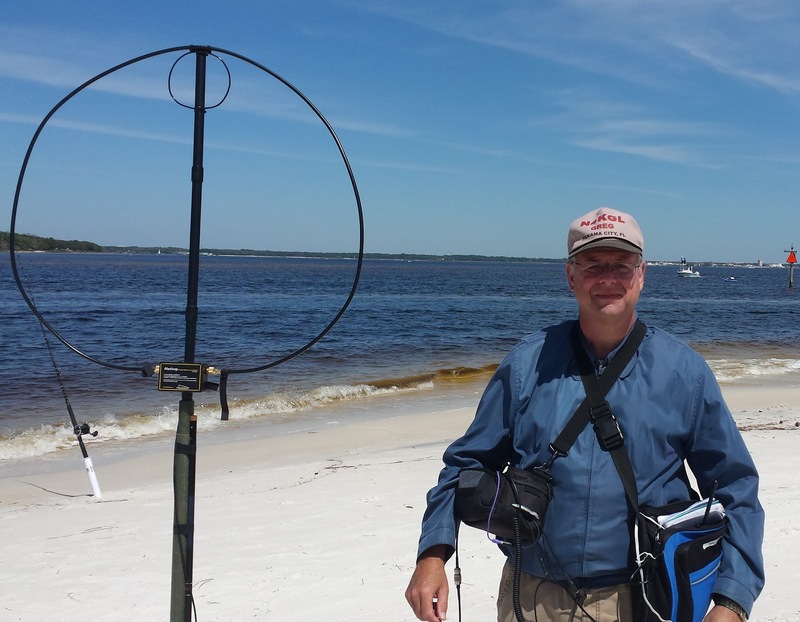 I visited St Andrews State Park near Panama City, FL to do some Rapid Deployment Amateur Radio RaDAR. I guess today was a checkout in anticipation of the RaDAR contest coming up on April 5th. This was an opportunity to test the KX3 and Alexloop in a Semi Pedestrian Mobile configuration. I call it semi because I only make QSOs at stops when I have the Alexloop planted in the sand. On one side I wear the KX3 in a video case with the top removed, On the other side is a pack with my 10 AH LiFePO4 battery plus all the miscellaneous items. I started on the North side of the park at the pier. The skies were clear but the wind was extra chilly about 10 AM. I worked AB5RE in Lubbock TX on 14.060. I notice the pelicans were cold and hungry. They gathered at the fish cleaning station. Near the pier is a picnic table. I took advantage of that and worked locals K4GXV, WB4BLX and N4STC on 146.565 simplex. Then I worked K4GXV, WB4BLX on 18.078 CW. Ron KK4DWE came out to join me. Continuing at the picnic table I got N0KV Ellis County TX on 18.136 SSB. Last contact was IW2HAJ on 28.402 SSB. I was kind of beat up by the cold but Ron inspired me to continue the 1 kilometer walk to Sandy Point. 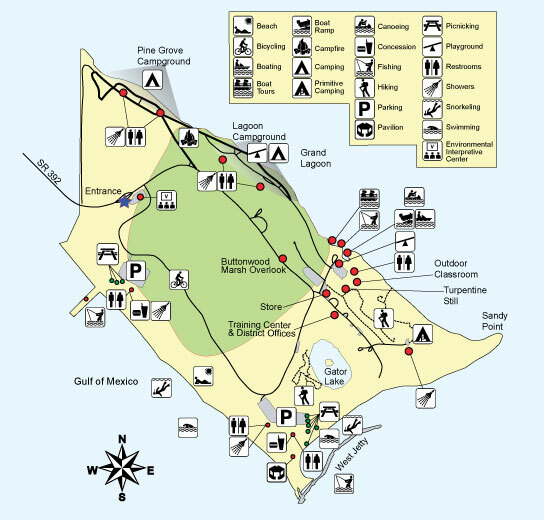 The walk is next to the Grand Lagoon which has lots of boat traffic and fisherman. The most frequent question was What are you tracking with the loop? I have thought up a good response: Orcas! Seen any? Greg N4KGL wearing the semi pedestrian mobile pack up. 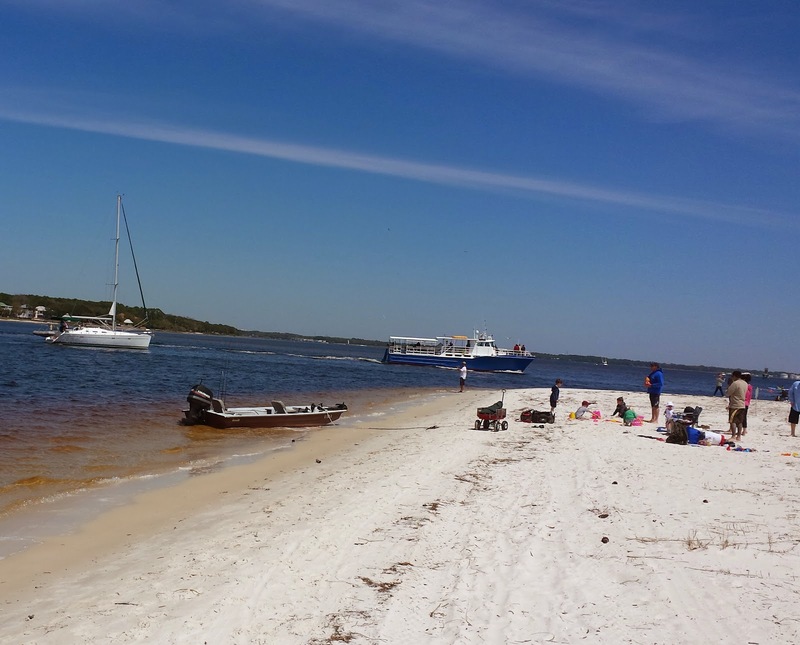 At Sandy Point on 17 meters SSB I worked KA2WDV in New York it was a struggle. That was followed by the best contact of the day. It was KB8HHA in Ohio who gave me a solid S9 on his meter and we had a nice chat. 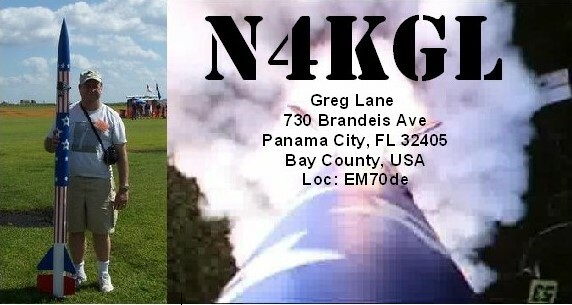 I worked locals WB4BLX and K4GXV on two meters and 17 meters SSB from the point as well. I wanted to make use of the leg key while standing and I snagged N7KY in Jackson, TN on 14.055. I did a number of CQs hoping to get some RaDAR buddies but no luck this time. I'd say the pack up did well for RaDAR. I carried no extras like my table or chair. I hope I am spared the chilly winds and any rain on April 5th! Are you ready for a exciting amateur radio challenge? Deploy as a portable station make five contacts walk one kilometer deploy again and make five contacts. Continue for the four hour period. You could do the same moving three kilometers via car, motorcycle, bicycle or other vehicle. 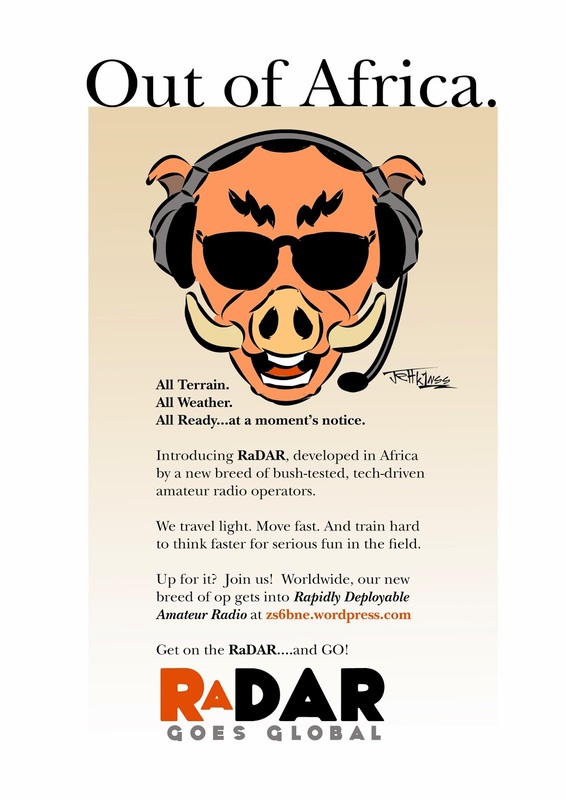 You have entered the world of Rapid Deployment Amateur Radio aka RaDAR. You will enjoy making tradeoffs in radio, antennas, and choice of operating frequencies. The four hour period puts you under a little stress to manage all the factors in real time. Hams worldwide practice RaDAR any time they can but there is the four hour RaDAR contest the first Saturday of April and November. 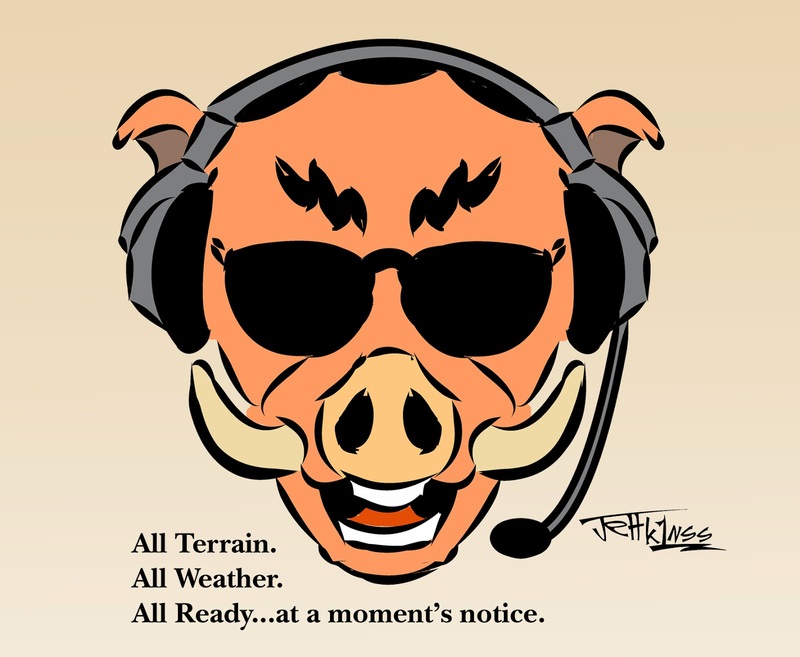 The next RaDAR Contest is April 5th 1400 UTC to 1800 UTC. There are events like Field Day and Jamboree On The Air, JOTA, that you might be willing to invest more time on an antennas and run more than QRP. I had an opportunity like that this Saturday at a local home show. In short, I used the Icom 7100 between 20 and 40 watts and an elevated doublet using the SGC 237 Tuner. It was handy to remote the tuner and the antenna from the operating position. I was able to sustain ops at that level for about 4 hours on a 15 AH LiFePO4 battery. The battery had plenty of juice left as I only used 6 AH but the 7100 started shutting down due low voltage around 11.5 while tuning. I looks like operating on battery for Field Day with the 7100 would be tough. 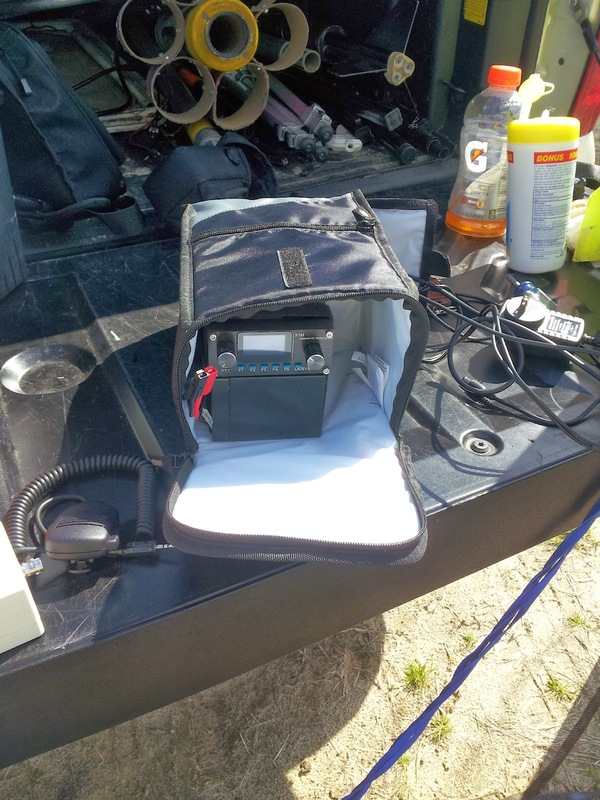 Note, I did get through the entire Field Day last year with the KX3 and the same 15 AH battery. Likewise, would I have done about as well with the Alexloop as the elevated doublet. I did operate at the home show last year. I looked back and I had about the same rate of QSOs with the KX3 and the Alexloop. So are the extra power and the more extensive antenna worth it? The answer is unknowable, but I rarely feel that I did better with the extra power and larger antennas. I think there is a level you might reach where you command the frequency with a amp and a beam. But if you are hunt and peck the rate is pretty constant. I see operating as a continuing series of imperfect experiments. Based on these experiments I can make my choices for future operating opportunities. 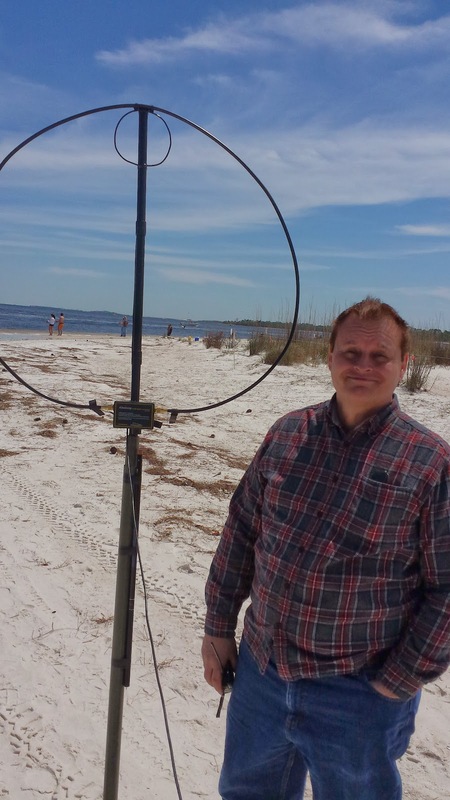 In fact, for the April 5th RaDAR contest I am going with Alexloop exclusively while last year I used end feds antennas and a 31 foot poles. This will minimize setup time and will be easy to transport by foot the required one kilometer between locations. 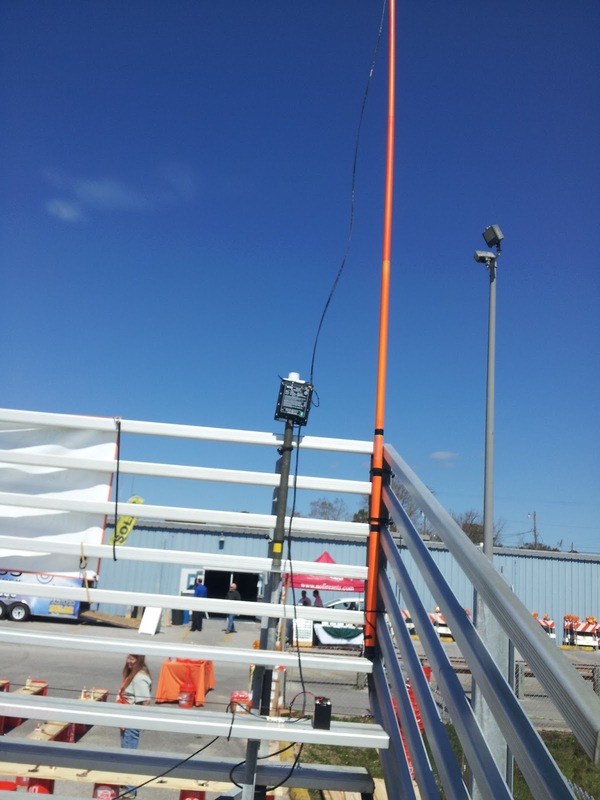 In any case, I enjoyed operating outdoors at the Home Show and the weather was nice. The antenna setup was fun. 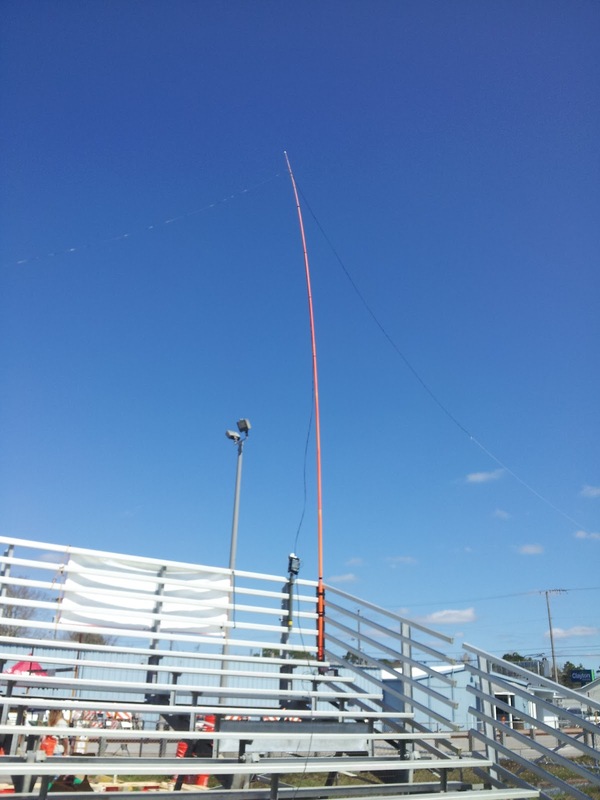 The bleachers helped get the 44 foot doublet about 45 feet high at the peak. The doublet was made from 300 ohm feedline and split for 22 feet on each side. The SGC 237 at the bottom of 31 foot Jackite pole. Then 70 feet of RG8X to Icom 7100. The doublet tuned fine 30 meters and up but would not tune 40 meters. 6 AH was used over four hours for 16 QSOs using between 20 and 40 watts. The rig started shutting down on transmit at key down to tune volts about 11.5. Battery had lots of life left with voltage at 13 volts on receive. So I switched to KX3. 10m CW 1 SSB 2. DX Canada, Netherlands, Hungary, Puerto Rico 2. States MO 2, NJ 2, MA, MN, MI 2, TX 2, ID, NY, VA and KS. Oh yes I had a relay QSO with Marcus NX5MK via KD2AJT Louise. His Alpha Loop was doing well to NY. Each RaDAR contest you get to strategize on your category and pack-up. I like the pedestrian mobile category for the April 5th 2014 RaDAR Contest. I plan to essentially wear the KX3 and battery. The Alexloop can be carried deployed. Therefore no setup and no pack-up. I can monitor the band while I walk the 1 km between locations. To operate I can just poke the pole in the sand. It has a spike on the end. I can stand, sit on the sand, or take advantage of a picnic table. I actually have a slightly different way of arranging the gear than the photos. It will take the load off my neck. I hope many will join the fun. RaDAR folks will making QSOs any way we can get them. Note, RaDAR participants will be sending their grid square in the exchange as six or more digits. If you are not in the contest your grid is optional. My call of course is N4KGL. Alex Loop on pole with a ground spike. Tenergy 10AH LiFe battery in case. KX3 in LowePro Edit 140 case with top removed. 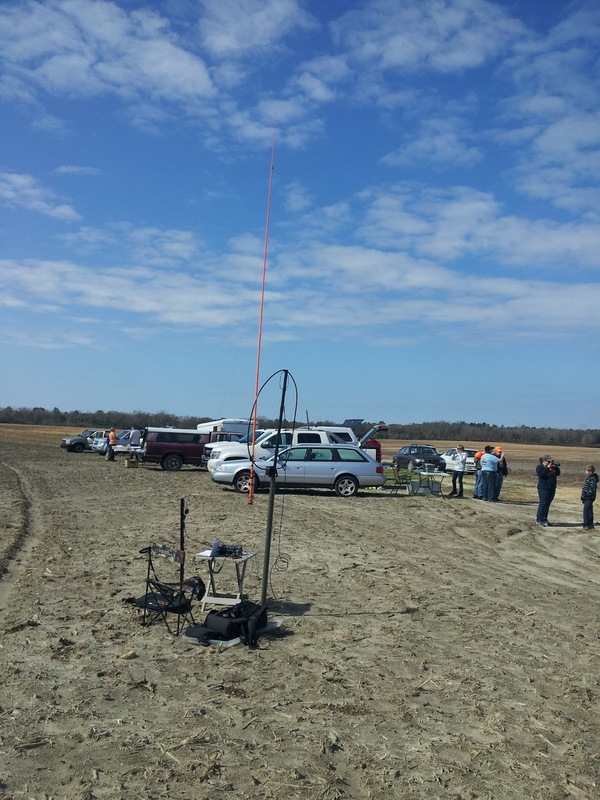 Saturday March 1st was a great day for rockets and radios in Samson, Alabama. John (W8JER) and Micky came to watch. The huge V2 rocket belongs to John Hansel. He had excellent launch on a blue Loki M motor. John Hansel's V2 launches on a M motor. I launched my five inch diameter payload rocket. The payload this time was a 2 meter fox transmitter. The hang time was just over a minute. My HF beacon payload was scratched for this launch. Jason N4JTC and his wife Tammy came just in time to see the launch. Jason is working on a cell phone based payload. Jason brought his RaDAR kit based on an X1M to show. 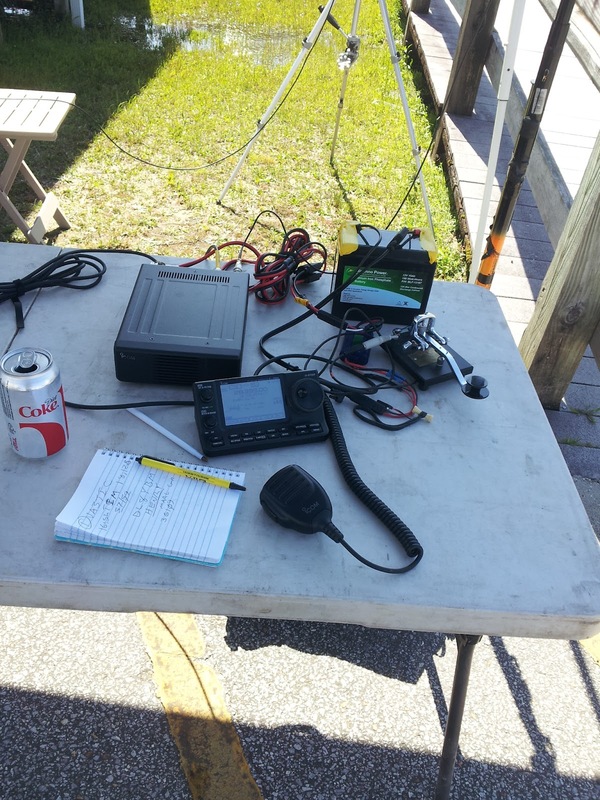 I setup my portable ham station with the Elecraft KX3. The antennas were the 10/20/40 LNR Trail Friendly End Fed and the Alexloop. I enjoyed contacting fellow RaDAR operator Pat N0YCA in Missouri on 15 meters CW. I went to Dothan to visit my parents after the launch. On Sunday I did some quick antenna work there. Since the ice storm destroyed the balun on the off center fed dipole at my parents house, I decided to insert an insulator and run 300 ohm line to near the ground. At that point I connected to my SGC 237 tuner. I can run coax to the workshop from there. Just as a quick test I setup the KX3 near the tuner. I had two QSOs with good reports on 20 CW. It is possible the feedline currents are unbalanced. But I don't mind some vertical radiation at all. The weather in Dothan Alabama was excellent for being in the yard. This was quite a challenge packing and combining all these activities. I guess it is good for my aging brain. The next launch could be March 15th if the farm in Samson is not planted at that time.